OK, I’ll go first…what is this? A beef underpass? No wait, I think I answered my own question after some patient viewing. The metal deck is slotted, not corrugated, The hooves of the cattle would catch in the slots. It’s a passive gate to keep the stock on this side (see the straw in right hand corner) The triangles keep them from falling in to the culvert while doing the happy hoof dance. I always thought it was weird that cows supposedly won’t cross one of these things. interesting that the road sign up ahead says ‘Grazing Area’…..like it’s there just to taunt the cattle who are stuck on this side of the gate! Are you sure you’re on the right road? Looks to me like miles of… nothing. A member of my family used these for grazing sheep too until one day some very clever sheep realized if they placed their tiny little hooves on the top of the flat metal beams they could slowly get across. They kind of liked being out but did not go too far since they didn’t want to go into unfamiliar territory. It was just the excitement of being “free” for a while I suppose. those things can be very scary to cross if you are a young kid! been there many times–use to cross one to and from my bus stop in jr. high (my sister was in elementary). and yes the open space below is suppose to scare cattle–although i’ve seen an ambitious cow jump one! I just don’t understand this photo at all. I guess growing up in Long Island and now living South Jersey would make me completely ignorant to this. What is it and what is it’s purpose? I love this blog and follow you every day. I’m glad you are well and the recipiant of so much kindness. The bars keep cows from crossing because they will see to the bottom and be afraid. Thus, the cows are “fenced” in without a fence. 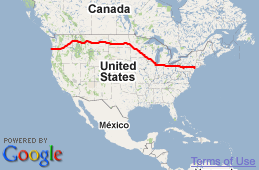 What’s really weird is that the southwest is full of cattle guards where the stripes are simply painted on the road. There is no ‘bottom’. And still the cows will not walk over the stripes. I really can’t figure that out. Ooooh! I remember those when I lived in Wyoming. They were everywhere on the roads. Gotta keep the cattle in their place dagnabit! :) They work really well too. I didn’t believe it until I saw it for myself living on a cattle ranch. Crazy! Alice…don’t feel bad. I grew up in NY and had NO CLUE about these kinds of things…but learned a lot when I lived in Wyoming. It’s pretty neat learning all about that cool stuff. I always wondered if these cattle guards wear uniforms… but I’ve never actually seen the “guard” ta ask him. Thank you all! As we can see, just by following this blog, it’s a big country we live in. 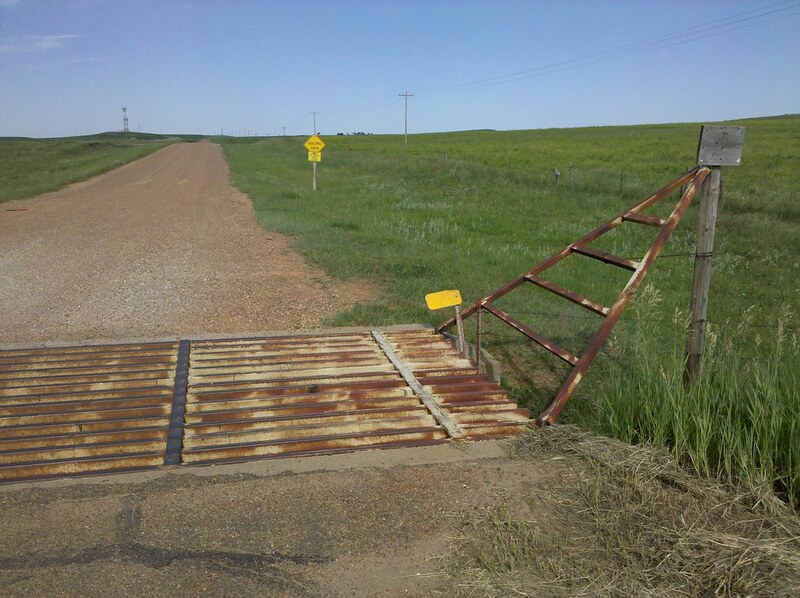 There was an e-mail going around about more cattle guards were needed out West. V. P. Joe Biden said we need to hire more of them. Alice you are excused but V. P., Joe Biden-well-that is a different story. He even wanted to appropriate more money to fund hiring more of these cattle guards! Actually, that e-mail about hiring & firing cattle guards is an urban legend. For you city folk, there are places in the west where stripes are painted on the roadway in place of real cattle guards. And they work. Look up Cattle Grid at Wikipedia. Seen those lots of times! Love them, much easier to ride my bicycle over than the actual metal ones! Ha ha! My grandmother has these on her farm to keep the horses from getting out. When I brought my husband up to her farm for a visit he kept asking me if it was ok to drive over them. I had to keep telling him to just keep driving. We used painted guards. Drop plywood over them and animals walk on through, sometimes you have to drop your coat over a side post or two to mask it even more. Gotta keep drainage around them cuzzin if they get dirt and mud on them animals just cross over.